Booths Garden Studios offer two ways to create a granny annexe type building in your garden. 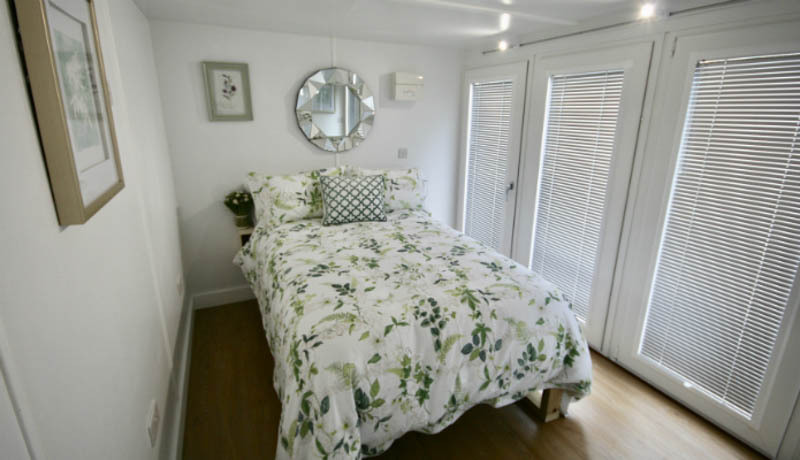 They have their flagship QC6 range which is building regulation compliant and planning friendly, and their QCB range which is built under the Caravan Act so can be installed without needing a planning application. You might wonder what the 'QC' stands for. Well, it's the 25-year maintenance free lifespan the buildings are guaranteed for. A new addition to the QCB range of annexes is this L-shaped building. This is the biggest granny annexe that the Booths Garden Studios team can install under the Caravan Act. The L-shaped building is made up of two wings. One being 24ft x 12ft (7.31m x 3.65m) and the other 12ft x 8ft (3.65m x 2.43m). They are joined together to create a large open plan living space with a double bedroom leading off this main space. Booths Garden Studios are known for their walls of glazing which flood the room with natural light. This L-shaped QCB annexe is no different. The walls where the two wings intersect are configured with floor to ceiling glazing — made up with a mix of doors and windows. As we can see from these photos, the walls of glazing create a light-filled room. The amount of light entering the room and privacy levels can be controlled easily with the Venetian blinds. The QCB granny annexe comes complete with a streamlined kitchen. The glossy white units and grey worktop sit discreetly in an alcove between the bedroom and shower room. This is a clever use of space that means the kitchen does not dominate the main living room. The QCB garden annexe comes complete with a shower room which features a good sized shower. The room is finished with shower boarding. This is a practical and easy to keep clean finish which with minimal joints. The shower room is completed with a good sized basin and toilet. Booths Garden Studios have designed the QCB garden annexe to be one of the most cost-effective granny annexe buildings on the market. This L-shaped example comes in at around £40,000 plus groundworks. The groundworks for connecting the annexe to the mains supply for water, sewerage and electricity have to be quoted on a case by case basis as they are dependent on where the annexe is positioned in relation to the house and the distances involved. It is a good idea to visit a garden annexe before you buy. Booths Garden Studios have one on display at their workshops. You can make an appointment to view it. Call the team on 07817 741 754 or drop them an email to book an appointment.